Use Dashboard to view metrics and configuration history for your cluster. You monitor your Hadoop cluster using Ambari Web. Dashboard provides Metrics and Heatmaps visualizations and cluster configuration history options. 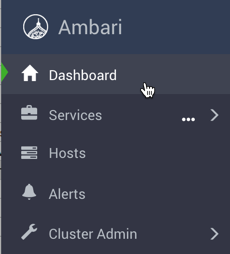 You access the cluster dashboard by clicking Dashboard at the top left of the Ambari Web UI main window. Use the Ambari Web Dashboard to monitor operating status of your cluster. Expand Services > to see top-level metrics about service operating status. Use the widgets on Dashboard Metrics to monitor cluster-wide metrics. Filter Dashboard > Metrics to see only metrics that reflect overll cluster health. The Ambari Web Heatmaps page provides a graphical representation of your overall cluster utilization, using simple color coding known as a heatmap. Use the Stack and Versions tabs add services to the stack, and register new version information before performing an upgrade. As a cluster administrator, you can view the list of Service Users and Group accounts used by the cluster services.